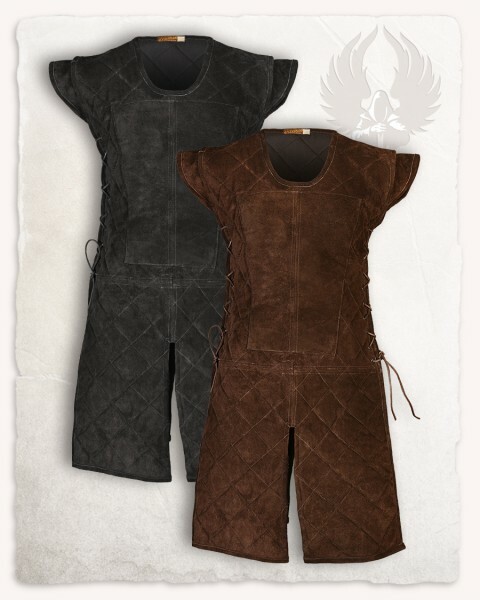 The tabard "Brandon" is made of soft suede. With its narrow diamond shaped stichings and light lining, it is ideal to be worn under armour without limiting the mobility of the wearer. It also works excellently as an independent upper garment. The wearing comfort of an armour is greatly improved and the wearer is effectively protected against bruises in combat. The chest of the knee-length tabbard "Brandon", is additionally reinforced in order to meet the demands of a cuirass or a chain shirt. Shoulder armours are comfortably padded by the flared shoulders. This avoids the rubbing of the straps on the skin or pressure points. By lateral lacing, "Brandon" can be individually adapted to the body shape. This tabard is, not only for armoured roles, an excellent base for many costume ideas.